Home Gadgets Is a Mandibular Advancement Device for me? Some people just can’t take CPAP. We fortunately there are other options. 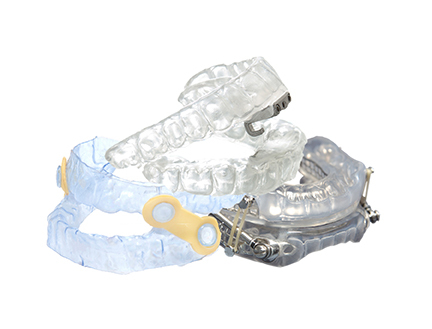 A mandibular advancement device or Oral appliance therapy (OAT) works in a different way than CPAP with the same goal to prevent the collapse of the upper airway. In this alternative therapy, the tongue and soft tissues in the back of the throat are pushed forward keeping theairway open during sleep. This forward thrust of the jaw leads to decrease in snoring. Not everyone, however, can wear this. Ideally, in order to qualify for a MAD you would need to have mild to moderate OSA or have had failed CPAP. MAD are not indicated for severe OSA. In addition to being an alternative therapy to CPAP, some people wear it in conjunction with CPAP. People who do this then to require less pressure to keep their airway open. So who is the ideal patient? Well, patients who are not obese and have mainly supine (sleeping on the your back) dependent apneas. Remember that a MAD is not a treatment for central sleep apnea or those with morbid obesity. You also have to have overall good dentition without many missing teeth. Research does tell us that the overall therapeutic effectiveness are similar to CPAP. Unfortunately one thing that is lacking is that there is no real way to monitor residual apneas while on treatment. In a survey study of patients, however, many discontinued use because of discomfort, lack of efficacy or switching to CPAP and frequent side-effects included dry mouth, tooth pain, and jaw pain. Some patients can find these devices somewhat uncomfortable. Another drawback is that these devices are expensive and tend to be covered less by insurance companies. Patients may pay over $1,000 out of pocket to secure these devices. Some people do think that a MAD is the lesser of two evils. What we can tell you is that for mild to moderate obstructive sleep apnea it is a consideration; especially if you are not obese and tend to have worse symptoms on your back.